Most kungfu styles have some sort of a salutation, which will be performed at the beginning and the end of a form. The salute is a sign of respect. It is used to greet the sifu (師父 shifu, master) and the fellow students, or the judges and public at a demonstration. There are many sorts of salutations, depending on the character or origin of a style. Most styles that have some sort of connection with the Siu Lam Temple (少林寺 Shaolin Si), have a salutation that looks like the figure on the left, this salutation is therefore called "Siu Lam Salute". At the Siu Lam salute the left palm covers the right fist, this symbolizes that Siu Lam kungfu is imbued with martial art spirit. The right hand/fist symbolizes the life-line"power" and the moon. The left hand represents the warmth and security of the sun. When putting the Chinese characters for the sun (日) and the moon (月) together, it brings the character for "Ming" (明) (Ming dynasty 明朝 Ming Chao). The right fist also symbolizes the Tiger (氣 Qi) and the left open hand the Dragon (blood). The Siu Lam salute was also used by the rebels and triads (三合會) (also called "hung moon" 洪門) during the Qing dynasty(清朝). They were fighting to overthrow the Qing dynasty and their goal was to restore the Ming dynasty. The salutation also means that the person is unarmed and coming"n peace", but the fist in the salute shows that when forced, it will defend. In some styles the salute is only "a salute" and in other styles like Hung Ga (洪家 Hongjia) it is also a fighting technique. 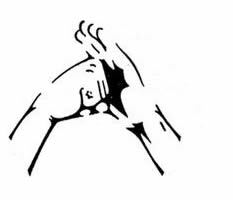 Chinese Martial Artist all over the world consider this hand position (salute) to be a gesture of good manner and respect. Pak Mei Pai (白眉派) is one of the few kungfu styles that has its own characteristic salute that is performed at the beginning and the end of all Pak Mei forms. 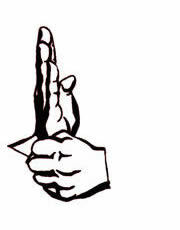 The closed hand/fist represents the Taoist part of Pak Mei and the open hand the Buddhist side. The name of the opening salute is in Hakka: Ng Fu Si Hoi Koi Chung (五湖四海開樁) and the closing salute is called: Ng Fu Si Hoi Siu Chung (五湖四海收樁). In the name (5 lakes 4 seas 五湖四海) the five fingers of the upper open hand represent the five major lakes in China and the four fingers in the fist represent the four seas that surround China. An other explanation is that the four hollows between the knuckles of the fist represent the four seas around China. In ancient China "5 lakes 4 seas" meant all (Han 漢) Chinese are one family. In a modern and more broader vision its means that all people cultivated by Chinese culture are brothers and sisters. An interesting detail is the difference between the Pak Mei salute and the Siu Lam Salute. In the Pak Mei salute the left hand is the fist, where in the Siu Lam salute the right hand is the fist. This also shows Pak Mei’s unique method. When the salute is made to another kungfu student, the salute means: All martial artists are one family, if you don't attack, it doesn’t have to come to a fight. This thought is from the days that many kungfu students often were members of the triads (三合會), resisting against the Qing dynasty. So, they all had the same goal and it was better not to fight each other. The Pak Mei salute is one of the main characteristics of the style and should be performed with respect and with precision. In the Pak Mei Pai school of sifu Jie Kon Sieuw (師父余官秀) the salute is just called "su ma" 手碼 or "hand symbol" = salute. The hand pulling to the left hip before the salute is done with explosive force (勁 Jin/king), is called in Hakka "Sok Su" (索手, suo shou) or rope hand. The way of performing the salute from the left hip up to in front of the chest is, in Holland, alias known as "putting the flowers in the vase". Where the left hand "looks" like a vase and the right hand like flowers. The execution of the salute is also done with power. The name of the Pak Mei salute can be different in Pak Mei branches. In the branch of sifu So Kim Kong 蘇劍光 (Cheung Bing Sum 張炳森 lineage), for instance, the opening salute is known as: Hei Sau Sik 起手式 (wake up salute) and the closing salute is called Sau Tsong Sau 收壯手 (collecting solemn). In our Association (余官秀同學會) we have two ways of executing the Pak Mei salute. We have "the old" salute as taught by sifu Jie Kon Sieuw (師父余官秀) and the "modern" variation as done in Hong Kong.